In my reviews of Doctor Who since Season Six, I’ve talked endlessly about what I’ve called the “Moffat Masterplan,” executive producer Steven Moffat’s four-year project to rejigger the show he inherited from previous showrunner Russell T Davies. You’ll no doubt be relieved to hear I’m mostly going to stop talking about it from this point forward, except to say this: the plan is pretty much complete, and—with last week’s overly didactic regeneration episode out of the way—the decks are now cleared. That means that we can almost view “Into the Dalek” as the first real episode of the Moffat era: it took him four years to get here, but I suspect that this is the show he’s wanted to be making all along. And what is his vision for the new Doctor Who? It turns out, as we suspected, to be old Doctor Who updated for a modern audience. As a famous band once sang—what was its name again?—Meet the new boss, same as the old boss. Doctor Who was far from damaged goods in 2009: Davies had not only resurrected the once struggling franchise; he’d also transformed it into the BBC’s flagship and a worldwide phenomenon. (I should also say—in case there’s any confusion on this point—that I happen to adore the Russell T Davies era.) But there’s no denying that the show Moffat was offered in 2009 was a very different creature from the classic series he’d grown up on. I don’t know Moffat, of course, and I’m not his shrink (though I clearly like to imagine I am). But nearly everything he’s done since he took over—as I’ve discussed many times before—has seemed designed to undo the bigger changes Davies had made and roll Doctor Who back to something more closely resembling the series from his childhood. Last week’s introduction of 56-year-old Peter Capaldi as the Twelfth Doctor —in an episode a little too self-consciously intended to preempt criticism of the changes—was just one of the final moves in a very long game. Without for a moment disparaging the Davies era (or Moffat’s first three seasons), one suspects that “Into the Dalek” finally offers us, for the first time, Moffat’s real vision. 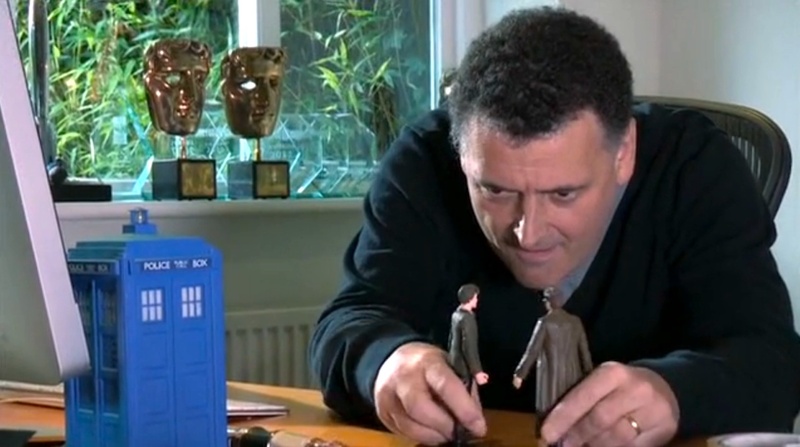 A full twenty-five years after it went off the air, Moffat finally has his hands on Doctor Who. And if this is the direction the show is headed in Season Eight (and beyond), I’m all for it. “Into the Dalek”—written by Moffat and Phil Ford—is not an all-time classic, but it’s a solid, satisfying hour of Doctor Who. More importantly, it’s an hour that firmly establishes that the Doctor, and the show itself, are not afraid to put the recent past behind them in favor of the distant past. 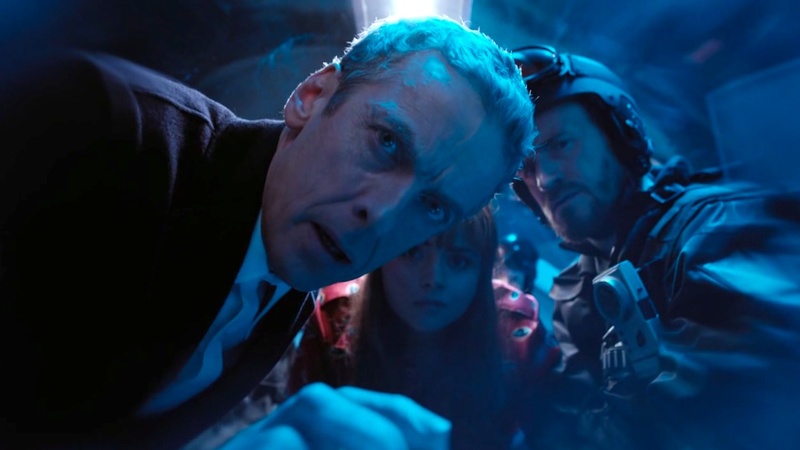 And so begins the journey inside the Dalek, with the Doctor, Clara, and a crew of soldiers shrunk down to enter the creature and repair the damage. (“Fantastic idea for a movie,” the Doctor says. “Terrible idea for a proctologist.”) This isn’t the most original concept: apart from the obvious reference to the 1966 movie Fantastic Voyage, the call-back is to a 1977 Doctor Who story called “The Invisible Enemy,” in which clones of the Doctor and his companion were shrunk down and sent inside the Doctor himself. 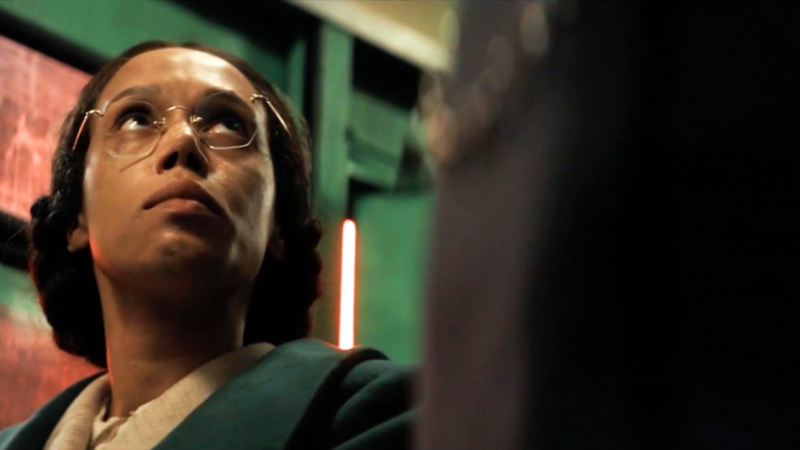 (And, more recently, Moffat has used similar inside-a-body dynamics—complete with hostile antibodies—in “Let’s Kill Hitler.“) But originality, refreshingly, is not the point. In fact, the willingness to be unoriginal is one of the things I appreciate most about this episode. Moffat has frequently been criticized for being “too clever by half,” and for stuffing every episode with too many ideas, too many twists, too many wibbly-wobblies and timey-wimeys. “Into the Dalek” shows us a barer-boned Doctor Who, with a simple (even familiar) premise, a clear storyline, and a satisfying three-act structure. 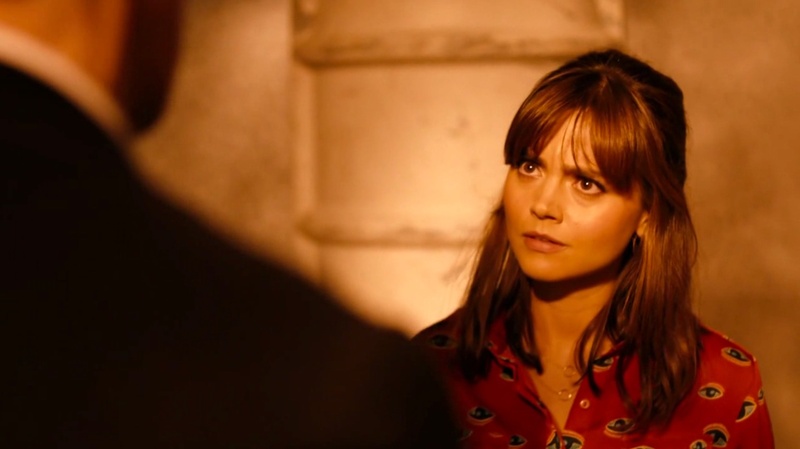 As a result, the pacing is also noticeably different from most episodes in recent memory: Ford and Moffat write scenes that play out at greater length, and director Ben Wheatley lingers lovingly on visuals and allows emotional beats to resonate longer. I loved Matt Smith’s hyperactive child, but this is a slightly more mature Doctor—and a slightly more mature Doctor Who—with a longer attention span. And the voyage inside the Dalek also allows the show to replicate another aspect of the classic series: the studio-bound adventure. Location shooting and cosmic landscapes are fun, but Doctor Who at its essence is a small group of characters running through corridors that have been dressed (and often re-dressed) to look alien. The set dressing is better than it used to be, and so are the special effects—though both are still occasionally, and comfortingly, dubious—and the action scenes are much better. (The climactic Dalek battle is one of the best the series has done.) But “Into the Dalek” has a marvelously old-school feel, right down to some trippy distortion effects (the first entry into the Dalek), and a long scene where the Doctor talks into the camera while rear projected images unspool behind him. Though the technology has been updated, very little here would have looked out of place on Doctor Who thirty or forty years ago. Though it has all of time and space as its playground, Doctor Who is at its best when it’s a little claustrophobic, a little intimate, a little more focused on characters, not spectacle. 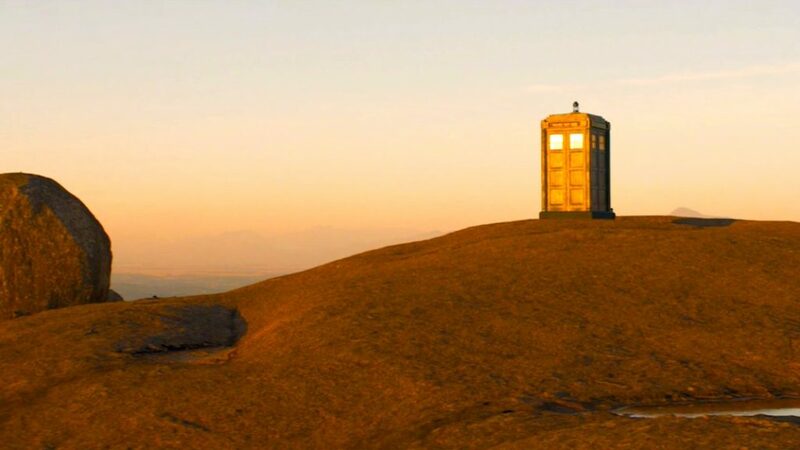 (Nothing made this more clear than the Russell T Davies era: his worst episodes tended to be the overreaching, overstuffed stories like “Journey’s End” and “The End of Time,” while the best Davies-penned story—2008’s “Midnight”—was practically a bottle-episode.) And, if Moffat is determined to rescue the best of the old series and merge it with the best elements of the new series, keeping the show firmly grounded in character—of both the Doctor and his companion(s)—is essential. (The classic series was personality driven, but very rarely featured much in the way of character development: stories were rarely about the Doctor and his companions, who tended to get involved briefly in other people’s stories.) This is one area where the new series has, in my opinion, improved the formula immeasurably; even if it has strayed, on occasion, too far into mawkishness and navel-gazing, new Who has allowed both the Doctor and his companions to learn and grow and change from their experiences. It is, admittedly, a tricky balance to strike. But, based on the evidence of “Into the Dalek,” Moffat and Co. may just manage to get this balance right. “Into the Dalek” is not centrally about the Doctor, but the story contributes to the overall character work Moffat has undertaken with the Doctor since 2010. 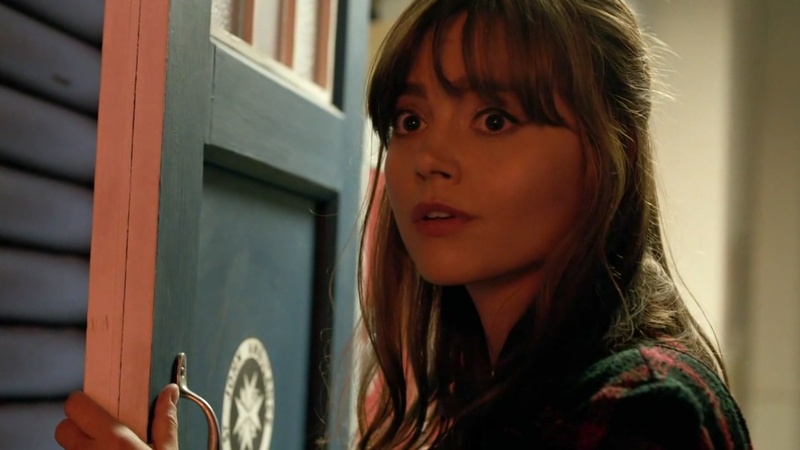 “Am I a good man?” he asks Clara, towards the beginning of the episode. “I don’t know,” she replies honestly. As I’ve written before—here, for example—this is one of the fundamental questions Moffat has been exploring all along, and I’m delighted to see he isn’t dropping this theme in his return to old-school storytelling. This episode touches on that theme by playing it off an old storytelling standby: that a hero is defined by his villain. What would Batman be without the Joker? What would Sherlock Holmes be without Moriarty? What would Robin Hood–who we’ll apparently meet next week—be without the Sheriff of Nottingham? For the Doctor defines himself in opposition to the Daleks. “You see, all those years ago when I began, I was just running,” he says here. “I called myself ‘the Doctor,’ but it was just a name. And then, I went to Skaro, and I met you lot, and I understood who I was. The Doctor was not the Daleks.” The Doctor represents humor and compassion and hope, while the Daleks are humorless, hateful, and nihilistic. The Doctor is intellect and creativity, while the Daleks are brute force and destruction. The Doctor is life, while the Daleks are death. The Doctor is a healer, while the Daleks are soldiers. But, if you’re defined by your foe, what happens when you are forced to reconsider your foe’s very nature? If you’re wrong about them, could you possibly be wrong about yourself? When it appears that the “good” Dalek was simply corrupted by its injury—”morality as malfunction”—Clara notices that the Doctor is secretly pleased to have his black-and-white view of things reconfirmed. “The Daleks are evil after all, everything makes sense, the Doctor is right,” she says, slapping him. It falls on Clara, the Doctor’s companion and “carer”—”She cares so I don’t have to”—to open his eyes. “Is that really what we learned today?” she asks, in her best teacher voice. So the darkest reaches of the Doctor have always been mapped in confrontation with the Daleks. And so it’s interesting that the first full Twelfth Doctor story redraws the map. Moffat has always been uncomfortable with the “warrior Doctor,” and, in “The Day of the Doctor,” he went so far as to undo the defining event in the modern Doctor’s life: his genocidal destruction of the Daleks (and his own people) in the Time War. The lesson he remembered there, on a grand scale, was the same one he remembers here, on a smaller scale: never be cruel or cowardly, never give up, never give in. There’s always another way, there’s always room for compassion, there’s always hope. As long as there’s the possibility that a Dalek could change—that a Dalek could actually be good—he’s obligated to act in hope, and not act like a Dalek. “A Dalek is a better soldier than you will ever be,” he says. “You cannot win this way.” He’s talking to the soldiers of the Combined Galactic Resistance—but he’s really talking to himself. The Dalek tells the Doctor that he is “a good Dalek,” and—though it sounds like an accusation—there’s some truth to it. There is always darkness within him: there’s always darkness in all of us, darkness that must always must always be guarded against and overcome. The Daleks represent the worst qualities in all creation, and we all have them within ourselves. 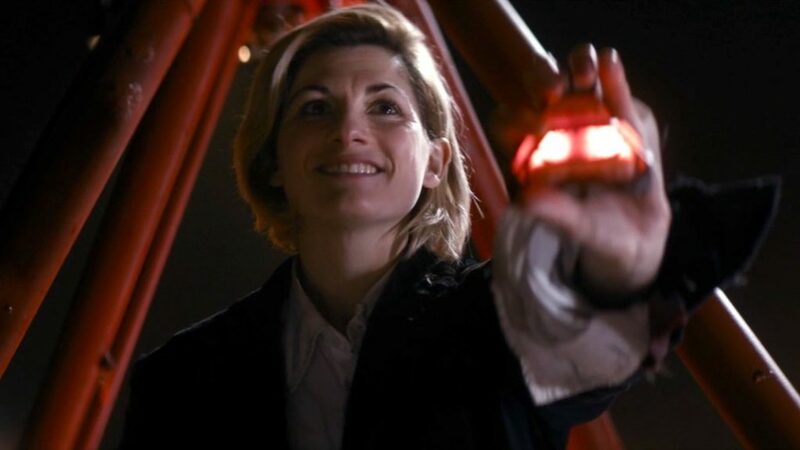 Doctor Who is not about being wholly good: it’s about choosing the good side over the bad side, deciding to do the hard right thing over the easy wrong thing, choosing to be a doctor and not a Dalek. 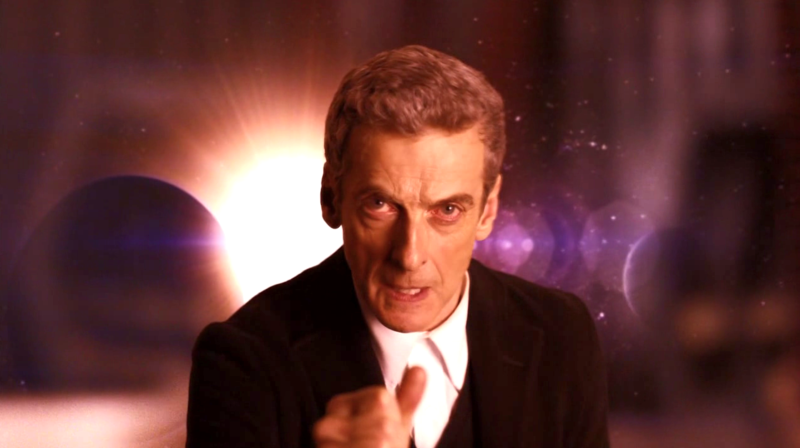 Capaldi is still not quite the Doctor for me—it’s going to take some time—but I am enjoying his performance immensely. He’s so restrained: he is taciturn where we’re used to garrulousness, and he dominates the room with stillness, not with motion. I did, I think, put my finger on what’s missing for me in his performance, however: so far, he doesn’t look like he’s having fun. To me, one of the defining characteristics of the Doctor is the amused pleasure he takes in everything, even—or especially—in life or death situations. (I always think of my favorite Tom Baker moment: the scene in 1977’s “Horror of Fang Rock” when he announces the situation to the gathered civilians. “Gentlemen, I’ve got news for you: this lighthouse is under attack, and by tomorrow morning we might all be dead!” And then he grins, beaming at them as though he’s delivering the best possible news he could have.) Even William Hartnell’s grumpy first Doctor got positively gleeful about his scientific expeditions and experiments. I’m all for a more serious, more mature Doctor, but I always want to feel that the Doctor is doing exactly what he wants to be doing. I will be the first to apologize if I am wrong, but I do not have high hopes for next week’s episode, “Robot of Sherwood.” Mark Gatiss has become my least favorite writer of Doctor Who—I thought last season’s “The Crimson Horror” was excremental—and the third episode of a season is often the “dump the dreck” slot. (See 2010’s “Victory of the Daleks” [also Gatiss], 2011’s “The Curse of the Black Spot” [not Gatiss], and last year’s “Cold War” [Gatiss, again, though technically the third episode of Season 7B].) Here’s hoping I’m wrong, and that Gatiss is due to surprise me. . .